From the moment I jumped off the beach straight on to the white clean sand of Long Beach on Perhentian Kecil I had a new favourite place in the world. The Perhentian islands, made up of Perhentian Besar (The Big Island) and Perhentian Kecil (the Small Island) are easily the closest thing to paradise I have ever found. They are what I imagine the Thai islands used to be like thirty years ago before hyper development ruined most of them. And now I’m stuck in this conundrum where I want to tell anyone and everyone how amazing these islands are, but I also don’t want the peace, serenity and largely unexplored nature of the Perhentians to be ruined. But I decided I had to let you guys know about this little piece of paradise just so you can have the same amazing experiences I had on the island. I spent two months living in Kuala Lumpur and during that time I made it to the Perhentian islands three times. I spent one four day weekend snorkelling and partying with a friend I had met in Europe who was also living in Malaysia, another weekend with the crew from my university program in Kuala Lumpur also snorkelling, beach bumming and partying, and then a whole week at the end of my time in Malaysia doing my PADI Open Water and PADI Advanced Diving courses. I’m planning on writing a specific guide to diving on the Perhentian islands so this post is going to focus primarily on everything that makes the Perhentian islands so great and some practical advice on what to do, how to get there, where to stay and what to eat. The access point for the boats to the Perhentian islands is via the small town of Kuala Besut. From here you’ll find boats leaving from 8am until around 4pm, so if you are going to arrive earlier than that you’ll need to find accommodation in town for the night. The fare is set at 70 ringitt for the return journey. The boat journey takes about an hour depending on how many stops and drop offs your particular boat makes. The cheapest and most backpacker friendly way to arrive in Kuala Besut is on the bus. I’ve taken the overnight bus both from Kuala Lumpur and from Penang to Kuala Besut. The fares never cost me more than 40-50 ringitt each way and the buses are pretty comfortable. I’ve also had friends get a bus from the Cameron Highlands so there are connections from all over Malaysia. Either way finding or booking bus journeys in Malaysia is super easy- head to either EasyBook or Bus Online Ticket. The benefit of arriving by overnight bus is that if you get in early enough you can hop on the 8am boat to the Perhentians. Not only does this mean you get the full day on the island but you also avoid paying the marine conservation fee because it is too early for the office to be open. If you prefer to fly the closest airport is Kota Bharu. It’s just over an hour from Kota Bharu airport to Kuala Besut provided there isn’t too much traffic. There is a local bus option but they are infrequent and it’s difficult to work out. The easiest way is to join a joint shuttle to the Kuala Besut pier of if there are enough of you grab a taxi. There are regular flights to Kota Bharu from Kuala Lumpur with Airasia and even flights from Penang with Firefly. Be aware that on the way back there are only three possible times for you to get the boat- 8am, 12pm or 4pm so plan your flights and/or buses accordingly. Where to Stay- Perhentian Kecil or Perhentian Besar? If you are a backpacker or a person that likes a bit of a party on the beach then you definitely want to be on Perhentian Kecil. I haven’t stayed anywhere else. The majority of dive shops and restaurants are located on Long Beach on Perhentian Kecil. This is also where you’ll find the beach bars and all of the night’s entertainment. The downside to this is the music can be blaring sometimes until 5am so if you book anywhere directly on Long Beach you’ll need some earplugs. The majority of the accommodation on Long Beach are basic beach huts or the basic dorms provided by the dive shops. The best dorm option directly on the beach is definitely Monkey Divers. Most of the places are also only connected to the public electricity which is usually only connected from 7pm to 9am. A midrange option on Long Beach is Matahari Chalets. I had a great stay here the first weekend I spent on the island. In contrast by far the most luxurious and expensive place on the beach is the Bubu Long Beach Resort. Expect huge beds, constant electricity, hot showers and all round luxury. A good compromise for Perhentian Kecil is to stay on Coral Bay or on the way to Coral Bay. Coral Bay is about a ten to fifteen minute walk from Long Beach so you avoid the noise of the partying if you want to have an early night, but the nightlife is only a walk away. The second time I visited the Perhentian islands I stayed at Tropicana Inn which is about a five minute walk from Long Beach on the route to Coral Bay. It’s further enough away to avoid the noise of the beach but not a very far walk at all. They have a relatively affordable dorm for 40 ringgit a night and have the benefit of a generator and thus 24/7 electricity. The bigger island tends to be home to only a handful of resorts that cater more to honeymooners or families. So if that’s your vibe it might be a good idea to head over there. A snorkelling trip is a popular and affordable activity on the islands. In fact the Perhentians is home to some of the best and most beautiful snorkelling I have ever done. If you’re alone and in a small group you can join one of the group boats, or if you’ve got a bit of a crowd you can basically charter your own boat. Either way these trips are easily booked and joined from any of the places along the beach. They’re often connected to dive schools and from my experience the price is usually the same. I recommend the full day or big tour. It includes four snorkelling stops; a bay where you might be able to spot a sole lonely sea turtle who I suspiciously believe is fed and cared for by the locals, a shallow reef where you’ll find amazing coral and fish, shark bay where you might be lucky enough to spot black tipped or white tipped reef sharks, and finally a coral garden where you’ll spot some of the most beautiful and colourful coral I have ever seen. Before Coral Garden you’ll also stop in the main part of town- The Fisherman’s Village- on Perhentian Kecil. Many locals live here and there is even a mosque so make sure to bring some clothes to cover up for the lunch stop. There are a few local restaurants selling cheap and delicious local food. The Perhentian islands is one of the cheapest places to get your diving accreditation in the world. I paid $420 USD to complete both my PADI Open Water and PADI Advanced Open Water course at Matahari Divers. They also threw in a week’s worth of accommodation in a basic dorm as part of the course. Look out for an upcoming post on diving in the Perhentians. One of my favourite things to do when I’m on an island is to sit on the beach all day, alternating between going for a swim, reading a book or having a nap. This is even greater to do on any of the beaches around the Perhentian islands as the water is crystal blue and the sand is a perfect white. It’s literally postcard perfect! But be aware of sunburn. I think it has something to do with how white the sand is but many of my friends and myself included ended up with some of the worst sunburn of our lives while on the Perhentian islands. My whole back, front and legs were so burnt that I blistered over. So make sure you are armed with a strong sunscreen, alternate between the sun and the shade and reapply often (and as soon as you get out of the water). The sunsets at Coral Bay are simply stunning and one of my favourite things to do was to head over there, grab a few beers and watch that sun come down. I’m much more of a water than a land baby so hiking isn’t something I actually got to do while on the island. The furthest I ever walked from Long Beach was the fifteen minutes over to Coral Bay. But some of my friends recommended going hiking on the island. A popular walk is to the windmill and lookout point which is about a half an hour walk from Long Beach. You could also hike over to the Fisherman’s village for a cheap lunch, or to Rainforest Beach which is a secluded beach home to the Rainforest Camping hostel/campground. From Coral Bay you can also hire some kayaks to paddle around the island. Some of my friends did this on a day I was way too hungover to do anything but sit on the beach. They took some snorkelling gear with them as well and stopped off at a few places to check out the reef. I loved the nightlife on Long Beach in the Perhentians. The beach is home to a couple of beach bars which start to really kick off around 9-10pm. My favourite place to hang out was definitely Abba’s Bar. Owned by a funky Malaysia island guy it’s essentially a wooden self-built shack. There are a couple of benches around the shack and then some tables on the beach. The alcohol served here is close to poison but it’s cheap and once Abbas adds his special sauce and mixture it tastes pretty delicious. Abbas also loves to make his drinks ‘extra spicy’ which basically means you get about three shots for 10 ringitt. You can also buy whole bottles and mixers here and Abbas will ply you with unlimited ice to make your own drinks. If you ask nicely Abbas will even let you plug your phone into his massive speaker to pick your own tunes, although his favourite were definitely reggae mixes. By my third visit to the island Abbas and I were old friends and I was always greeted with free shots. Next to Abbas is the main beach bar where you’ll find a DJ and a fire show. They’ve got some pretty decent cocktails but you’ll pay twice the price as Abbas (although they may be less likely to kill you). If you wander up and down the bar you’ll also find some smaller ones but the main action tends to be congregated around Abbas and the Beach Bar next door. For all the time I spent on the island I only ate at a few select places which offered affordable and delicious local Malaysian food. The main four restaurants on the islands are an array of different coloured seats and I’d recommend not eating at any of these places. They tend to have huge menus which means the food takes forever, it is mediocre and it is overpriced. By far the best and cheapest place to eat on the island is the white tent located just in front of Oh La La Divers, right by the volleyball net. I can’t quite remember its name but it begins with K. They have an assortment of fruit shakes, Malaysian dishes like stir fried noodles or fried rice with seafood, squid, chicken etc, and some truly amazing roti bread. I always grabbed a lime juice and roti bread for breakfast here, and then returned for some fried noodles, fried rice or even a toasted sandwich for lunch. Nothing on the menu costs more than 7 ringitt and absolutely everything is delicious. The only catch is that it isn’t open at dinner time. Located up the beach on the way to the pier, Awatif was my go to dinner spot while on the island. During my first two visits to the island you could pick up basic fried noodles or fried rice for less than 6 ringitt. Unfortunately prices did hike a little for my third visit to the island. But you can easily eat at this restaurant for 10-15 ringitt and absolutely everything is delicious. You’ll find great western choices along with Malaysian classics. They also had the best roti canai that I had during my whole two months in Malaysia! I’ve eaten here at least twelve times and never had a bad meal. If you are sick of Malaysian food then you need to head to the restaurant and bar at Oh La La divers for some incredible wood fired pizza or a delicious burger. I didn’t discover this place until my last trip to the island. It’s western food in Malaysia so it’s obviously not super cheap but the pizza is incredible. It even got my pizza obsessed friend’s stamp of approval. Located on the way from Long Beach to Coral Bay, Ewan’s has a great range of affordable and delicious Malaysian and Western food. I particularly loved all of their seafood dishes, and their curry laksa (one of the best I had in Malaysia). Expect to pay around 10 ringitt for a meal if the prices haven’t jumped too much. I couldn’t get enough of the Perhentians islands when I was in Malaysia and I keep telling everyone I met to go there. 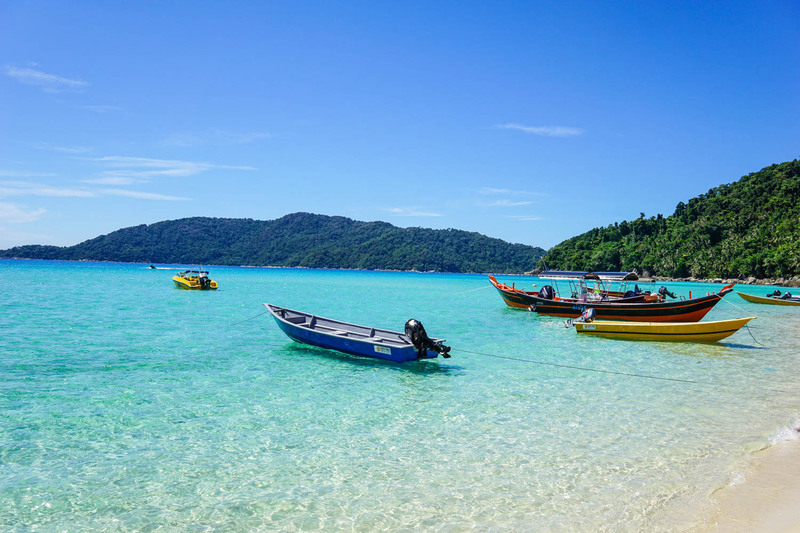 Malaysia is such an underrated country in the Southeast Asia travelling and backpacking scene and places like the Perhentians islands prove it. Despite how stunning it is prices on the island remain pretty affordable, only being slightly more expensive than the island which is ridiculously cheap. I’m so happy that I’ll be returning to Malaysia in June this year, as at least another two trips to the islands are in order. I’ll be sure to update this guide following those trips too!